Santa Monica’s new fast-casual burger joint uses grass-fed Wagyu beef from New Zealand. 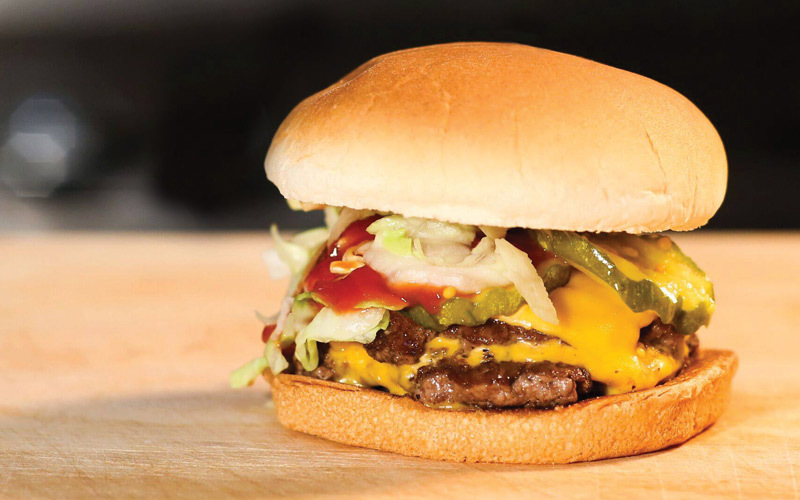 Go for the signature mustard-grilled cheeseburger (above), which sports onion jam, bread-and-butter pickles, ketchup, and shredded iceberg. Visit the Rooftop at the Standard hotel in DTLA on weekdays and you’ll find Vietnamese sandwich pop-up Banh Oui serving a juicy patty creation topped with caramelized onions, chicken liver pâté, mint, cilantro, and tangy nuoc cham dressing. Think of it as a banh mi in burger form. Golden Road Brewery founder Tony Yanow took inspiration from traditional English pubs for his new neighborhood brewhouse on Pico. But if you’re not in the mood for Cornish pasties, try the eponymous burger crowned with smoked bacon, arugula, pickled onion, and blue Stilton cheese.